Description: Crawling through Otranto at 10MPH. The 4451 was built as a replacement for 4408 which was destroyed in a wreck. Description: Stopped at the restored Grafton depot. Description: The eastbound local is surrounded by miles of corn as it heads toward Albert Lea. Description: This local heading east from Austin to Albert Lea looked a little better than its westbound counterpart, having a pair of SOO units bracketing the lone bandit patch ex MILW unit. It also had a SOO caboose trailing its 7 cars. Description: This is Davis Junction; an otherwise odd spot on the map that attracts your attention, which leads to a trip to see what's there. It's drizzling and gray- but the station still stands at the crossing of the former MILW (now SOO, later CP) main and a joint BN (CB&Q)/Soo (MILW) branch. Off to the side are a pair of GP38-2s and a former MN&S SW1500. Fascinating place- and worth the stop. Description: SOO GP38-2 4451 and CP GP38-2 cross the Wisconsin River with a local. Description: CP train #589 leads the #883 and #291 thru the small town of Dresbach - Ya gotta love the classic Soo Line! Description: SOO GP38-2 5551 leadsa a eastbound local through Franklin Park. Description: CP La Crosse Road Switch power. Starting to show her age. 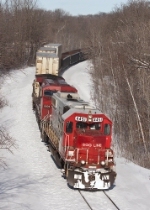 Description: One of the last GP38-2's made for the Soo Line. Description: A SOO geep leads a sick AC4400CW around a curve south of Detroit Lakes, under the cty. rd. 6 overpass. Description: Transfer 1 comes back from New Brighton and up to Lexington Industrial Park to get in the clear for a Dresser Turn. Title: SOO 4451, CP's Tomah Sub. Description: Second highest numbered Soo GP38-2. Description: G68 power waits for its next assignment at the east end of the yard. Description: Got the best shot I could of this Soo unit by zooming in over the roof of the Ford Yard office. Turned out pretty decent. Liked how I got the Espee boxcar into the shot. Description: Portrait shot of the two units, taken from the Cleveland Avenue bridge.